Looking for the best body groomers on the market? We researched and tested the best body hair trimmers to find the perfect grooming tools for manscaping. Whether you’re shaving hair on your chest, back, balls, arms, head, beard or the rest of your body, using a high-quality men’s body shaver is important if you want a close cut without irritating your skin. With that said, we looked at the leading brands, including Philips Norelco, Remington, Mangroomer, and Gillette to come up with what we think is the list of best body trimmers for men. As expected, the Philips Norelco Bodygroom Series 7100, an all-in-one trimmer and shaver, came in as the top-rated grooming product. Here are the best men’s grooming kits for body hair and beard! If you want to trim and shave your body hair with confidence, using a top body groomer can make all the difference. The Philips Norelco Bodygroomer 7100 is one of the most versatile body hair trimmers and shavers in its class. It offers a classic dual-end design for both shaving and trimming, allowing you to conserve precious space in your bathroom or shower while still enjoying the benefits of both tools. Thanks to the specially-designed 3D pivoting head and hypo-allergenic materials, you won’t have to worry about irritation just to get a nice, clean, touchable shave. This also means this body groomer is great for men with sensitive skin who want to avoid razor bumps. Furthermore, the self-sharpening blades and the adjustable comb are rounded to help avoid unwanted cuts and nicks. The built-in combs can adjust to five sizes from 1/8 inch to 11/25 inch, so you can get the look you want. In general, the blades require no maintenance or lubrication, but the foil may need to be changed once a year, depending on frequency of use, to maintain peak performance. The Philips Norelco Bodygroomer is cordless and rechargeable, with a run-time of 50 minutes. To recharge, just plug in the charger for an hour and you’ll have full battery life. This quick charge is a huge convenience and benefit compared to other trimmers that need hours. Thanks to its water-resistant design and casing, the trimmer and shaver work well wet or dry so you can use them in the shower or toss the machine in your suitcase for quick shaves and trims on the go. The side panels and buttons are constructed from soft rubber, which is ideal in all settings. In the box, you’ll get the body groomer, charger, the stylish foldable charging and storage stand, and the cleaning brush that makes cleaning the combs and blades easy. Philips Norelco backs this product with a 45-day money-back guarantee, so if you aren’t satisfied with its performance, just send it back for a full refund. In addition to the easy return policy, guys also get an amazing two-year warranty which protects you in the event of a failure due to faulty materials or workmanship. The bottom line is that the Philips Norelco Bodygroom Series 7100 is the best groomer and shaver on the market. With sharp blades, a powerful motor, long-lasting battery for cordless use, ergonomic water-resistant design, and money-back guarantee, it is the ultimate grooming tool for men. The Remington PG525 Body Groomer Kit is an outstanding value. This fully-loaded beard and body trimmer includes everything you will ever need for shaving and grooming in a sleek, handsome-looking package. Though this product is only for dry use, its versatility more than makes up for its lack of shower compatibility. The Remington PG525 was designed to trim and shape your hair, facial hair, and body with ease thanks to numerous attachments and adjustments. 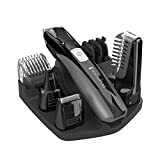 These include the full-size trimmer, foil shaver, an individual nose, ear and detail trimmer attachment, hair clipper comb with 8 different length settings, and 3 combs for different beard and stubble lengths. The lithium battery powers the groomer for up to 70 minutes of use on a single charge, and thanks to its self-sharpening surgical steel blades, you can rest assured that they will remain sharp and precise for a long time to come. An LED indicator updates along with the battery level and lets you know when the unit is charging. The plastic attachments are easy to apply and remove, and when you are finished, just rinse them under water and allow them to dry. The main trimmer is covered under a two-year limited warranty by the manufacturer, but as one of the top-selling personal groomers on Amazon, you really don’t need to worry. With thousands of reviews and a reputable brand in Remington, this high-quality body hair trimmer will satisfy all your grooming needs. The Mangroomer Ulimate Pro Back Shaver is the best back shaver. Back hair is just a fact of life for many men, and the struggle associated with removing that back hair without a helping hand is real. However, thanks to the Mangroomer Back Shaver, you can shave or trim your back by yourself in a matter of minutes. This body shaver boasts a unique and patented design that allows you to reach your entire back from shoulders to lower back. This back trimmer was able to power through tough, thick, coarse hair effortlessly. 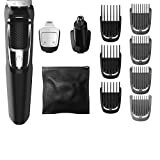 It comes with two interchangeable attachment shaving heads with shock absorption built right in, a long-reach ergonomic handle and extension lock, easy-to-use hinges for shaving at different angles, and a unique Power Burst feature for those thicker, coarser patches of hair. The first shaving head is the 1.8-inch ultra-wide option that makes quick work of longer hairs on your back. The second is the foil body groomer bi-directional head, which is best for maintaining a close cut and removing shorter hairs or stubble. The self-sharpening stainless-steel blades are hypo-allergenic and non-irritating. If you want to look and feel perfectly manicured, the Mangroomer Pro Back Shaver is a product that you won’t want to do without. Though it is not designed for use in the shower and can only be used dry, it does boast a powerful rechargeable battery and an LED indicator that shows the charging status and the battery level. The rubberized grip makes it comfortable to use, even for 10 to 15 minutes at a time. 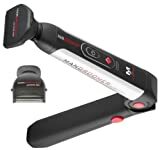 Whether you just want to remove hair for your own personal needs, to spark some romance and please your wife, or to keep your tattoo looking fresh, the Mangroomer Pro Back Shaver is worth the investment. It also happens to be a great value for the price, especially with the one-year warranty. If you have back hair and want to get rid of it, you need a good back shaver and the Mangroomer Ultimate Pro is the highest-quality machine you can get. 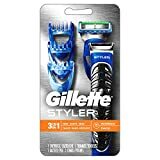 Gillette is one of the most well-known names in men’s grooming and shaving, so it comes as no surprise that the Gillette Fusion Body Groomer is a popular groomer and beard trimmer. This trimmer, shaver and edger system has been dermatologist tested and approved, which is always a huge benefit when trimming body or pubic hair. The men’s razor and styler is slim and compact with the ability to reach all your sensitive private areas, and the charging stand’s footprint is ideal for anyone who has a limited amount of space, but still needs ample trimming power. This men’s body trimmer includes 3 custom-length combs and a precision edging blade in a small, affordable package. It shaves, trims, and styles facial and body hair in minutes, and it does so just as well as some of the other, more expensive trimmers out there. Despite its ergonomic, slick design, the trimmer is powered by a powerful Braun motor that will cut through all types of long, thick hair. Perhaps one of the best and most innovative features of the Gillette Fusion Body Groomer is the fact that it fits any Gillette Fusion razor cartridge, which allows you a level of customization unlike similar products. You can groom body hair with the trimmer and then get a smooth, close shave with the razor. The shaver is also waterproof, which means you can use it over the sink or even in the shower – the choice is completely yours. It’s one of the few trimmers that comes with an edger, allowing you to get crisp, clean lines on your beard or neck. And thanks to its compact size and the included combs, you can easily trim hair on your chest, arms, legs, balls and private areas to maintain your personal sense of style. Other guys say this is the perfect body hair trimmer for at home and on the go, so if you regularly visit the gym and you want a body shaver to take with you, the Gillette Fusion ProGlide is a great choice. It is ideal for both men and women, and its small size makes it perfect for hard-to-reach sensitive areas. Its relatively cheap price makes it an outstanding value, but it only comes with a 90-day warranty that does not cover the combs or other accessories – only the shaver itself. But with Braun-engineered technology, quality materials and excellent design, men can buy this hair trimmer with without issues. 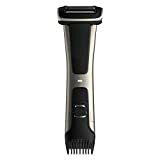 If you’re someone who wants complete flexibility for both facial and body trimming, the Philips Norelco Multi-Groomer body hair trimmer is an excellent and affordable choice. Despite being the most affordable personal groomer on our list, this machine is built to last with unbreakable, rust-proof tempered steel blades, reinforced guards, a robust motor, and long battery life. This high-performance trimmer will quickly become the backbone of your grooming routine. For starters, this model features the brand’s DualCut technology, which offers 2x the self-sharpening blades. Tests revealed that the blades remained sharp as new even after a couple years of use. The rechargeable battery for cordless use is also a plus, but the unit can only be used dry. With each full charge of the lithium-ion battery, you get up to an hour of continuous run-time. However, the best part is the five-minute charge time – even if you forget to plug your trimmer in after the previous use, all it takes is five minutes to get enough power for a full trim. The attachments – including the metal blades, nose and ear trimmer, and multiple hair and beard guards – can be safely rinsed with water after each use. It’s one of the few body trimmers that comes with an effective stubble guard, and this allows you to keep that rugged five o’clock shadow look day in and day out. With so many quality parts and features, it’s easy to see why the Philips Norelco Multigroom Series 3000 is one of the most popular body groomer products available right now. And the company is so confident in its product’s design that it offers a 45 day risk-free trial and then a full 2-year warranty. Even men who are dedicated to daily manscaping find that this is the only product they need. For guys who want a more premium product with a very powerful, full-metal motor, 3 hours of cordless run-time and a full set of guard sizes, check out the Multigroom 5000 Series. If trimming body hair on your back, chest, legs, arms and private parts is a regular part of your grooming routine, it’s critical that you invest in a good body groomer. These top-rated grooming machines are your best chance at showing off soft, smooth skin with no hair or irritation. With a list full of the best trimmers from the highest-quality brands in the industry, you can buy a clipper with confidence!